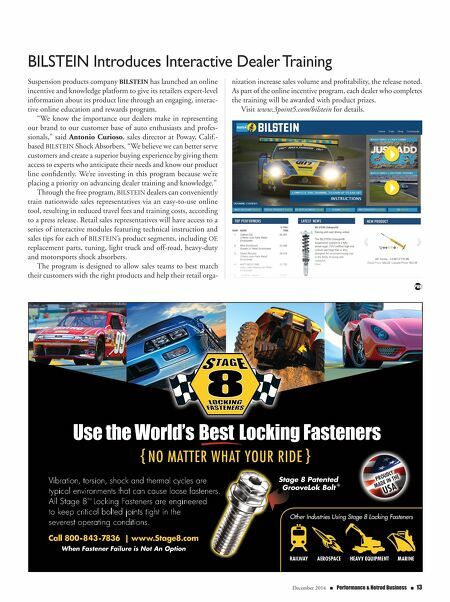 December 2014 n Performance & Hotrod Business n 13 BILSTEIN Introduces Interactive Dealer Training Suspension products company BILSTEIN has launched an online incentive and knowledge platform to give its retailers expert-level information about its product line through an engaging, interac- tive online education and rewards program. 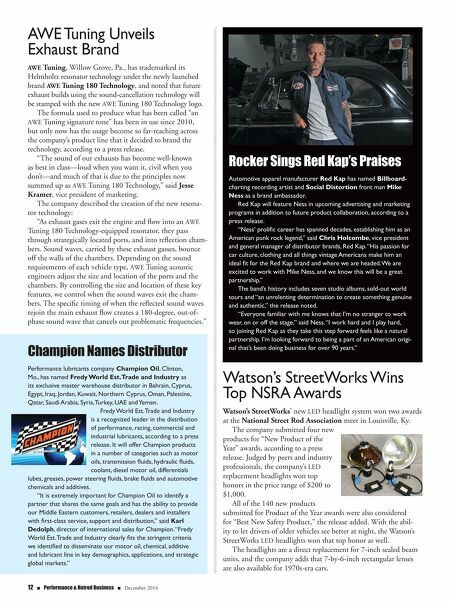 "We know the importance our dealers make in representing our brand to our customer base of auto enthusiasts and profes- sionals," said Antonio Curioso, sales director at Poway, Calif.- based BILSTEIN Shock Absorbers. "We believe we can better serve customers and create a superior buying experience by giving them access to experts who anticipate their needs and know our product line confidently. We're investing in this program because we're placing a priority on advancing dealer training and knowledge." Through the free program, BILSTEIN dealers can conveniently train nationwide sales representatives via an easy-to-use online tool, resulting in reduced travel fees and training costs, according to a press release. Retail sales representatives will have access to a series of interactive modules featuring technical instruction and sales tips for each of BILSTEIN's product segments, including OE replacement parts, tuning, light truck and off-road, heavy-duty and motorsports shock absorbers. The program is designed to allow sales teams to best match their customers with the right products and help their retail orga- nization increase sales volume and profitability, the release noted. As part of the online incentive program, each dealer who completes the training will be awarded with product prizes. Visit www.3point5.com/bilstein for details.